You’d think that things would be quiet in the literary community midsummer, but the calendar is surprisingly busy, and with many interesting events. Here are some highlights. You’ll find more information about each on the calendar page. Those of you who live in Petaluma are probably familiar with the Aqus Café. More than a coffee establishment, Aqus is a cultural hub, a community center, with art on display, live jazz, folk music, Irish/Celtic music, trivia games, poetry readings, movie nights, and more. In 2006, John Crowley, originally from Dublin, opened Aqus Cafe to provide a shared space for gatherings in this spirit of people sharing, connecting, and just getting to know each other. Since then, hundreds of people gather each day at the Café, creating a culture of community that has spread beyond the Café walls. Check out Aqus’s website www.aquscafe.com, where you’ll find all kinds of information, including a calendar of Aqus events, how to become an Aqus member, and a newsletter with announcements and community happenings. Aqus is located at the Foundry Wharf, 189 H Street. I’d like to keep posting your responses to our shifting climate and current drought. Has the weather drawn from you an essay? a poem? a rant? A lament? If so, please send me what you’ve written. You can send me your thoughts to tehret99@comcast.net. Please write Thoughts on the Drought in the subject line. Try to keep contributions under 250 words. This month, Redwood Writers and Copperfield’s Books in Montgomery Village, Santa Rosa, have teamed up for three evenings called Hot Summer Nights. The first of these is Tuesday, July 8, 7:00-8:00 p.m. when the theme is “Love and Poetry” with featured readers Michelle Wing, Patricia Nelson, Juanita Martin, Pamela Taeuffer and Kay Mehl Miller. Then on Tuesday, July 15, 7:00-8:00 p.m., the theme will be “Short Stories,” with featured readers Jean Wong, Jo Lauer, Kate Farrell and Sunny Lockwood. The July series finishes up on Tuesday, July 29, 7:00-8:00 p.m. when the topic is “Fiction” and the featured readers are Jeane Slone, Julie Winrich, Thonie Hevron and Lenore Hirsch. The Sebastopol Senior Center launches its first Open Mic on Thursday, July 10, 1-3 PM. Call 829-2440 to sign up. Location: 167 High Street, Sebastopol. Later that same day, 7:00-9:00 p.m., Cloverdale Performing Arts Center presents Books on Stage with Sonoma County Poet Laureate Katherine Hastings and novelist Gil Mansergh. Location: 209 North Cloverdale Boulevard, Cloverdale. On Friday, July 11, 7:00-9:00 p.m., you can enjoy a double book launch featuring Donna Emerson & Phyllis Meshulam at Occidental Center for the Arts, 3850 Doris Murphy Ct.,Occidental. Bibliophoria Artwalk gets under way on Saturday, July 12, 9:00 a.m. This is a book and print lover’s 2.5 mile round-trip walk exploring the many book resources of Sebastopol. And here’s something new: “Critters and Creators,” a free reading, RiskPress Gallery, 7345 Healdsburg Ave., Sebastopol on Friday, July 18, 6:30-8:00 p.m. Featured readers are Iris Dunkle, Jodi Hottel, John Johnson, Carol Wade Lundberg and Phyllis Meshulam. They will read in the midst of the critters created by Jann Aanestad and Nancy Winn. 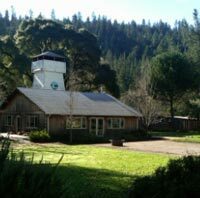 For many years, Wellspring Renewal Center in Anderson Valley hosted a writing retreat on the banks of the Navarro River. When I was teaching there, I used to lead the writers in building a seven-circuit labyrinth. The stones would stay in place until the river rose in the winter, carrying them downstream towards the sea. Thus, the building of the labyrinth became an annual event. Wellspring closed a few years ago, but the retreat facility is still there, now reopened as River’s Bend Retreat Center. If you can’t get away to the Mendocino Coast Writer’s Conference or the Napa Writers’ Conference, but would like some creative writing time, consider booking a personal retreat. Here’s the website for more information: www.riversbendretreat.org. July’s Poem: For this month, I’m featuring two poems that express a love of home-country in different ways. 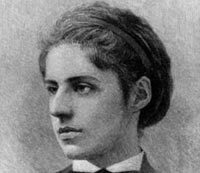 Emma Lazarus was born in New York City to a wealthy family and educated by private tutors. She began writing poetry as a teenager and took up the cause — through both poetry and prose — against the persecution of Jews in Russia during the 1880s. Lines from her sonnet “The New Colossus” were engraved on the pedestal of the Statue of Liberty in 1903. Lawrence Ferlinghetti is a poet, playwright, editor, and painter, perhaps best known as the founder of City Lights Pocket Bookshop (now City Lights Books), San Francisco, and editor of City Lights Books, 1955—present. Lawrence Ferlinghetti, “I Am Waiting” from A Coney Island of the Mind. Copyright © 1958 by Lawrence Ferlinghetti. Reprinted with the permission of New Directions Publishing Corporation, www.wwnorton.com/nd/welcome.htm.